Park Therming Projects, leader in the manufacture and marketing of themed products in Spain, has trusted Europa Prefabri for the supply and installation of a modular ensemble. The modular ensemble will be used by the company’s employees for dining and changing rooms. 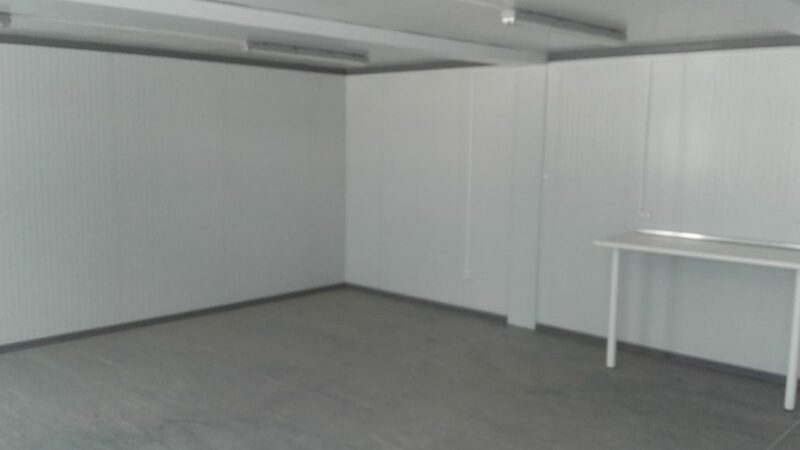 The modular portakabins have been installed at the company’s three locations in Orihuela (Alicante). 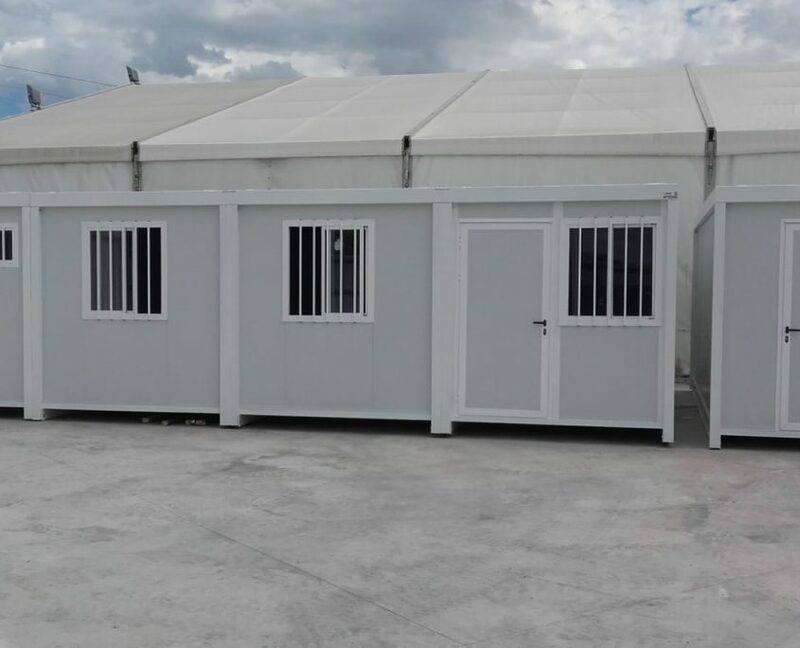 We provided and installed a modular ensemble, a sanitary module, a modular office and an open portakabin with a side toilet. The materials we use in our construction system are of high quality. At first, the modules offered are those of our standard line, always maintaining the functionality and quality of the elements. From here, we can offer improvements, both in quality and design, by incorporating other materials. All our modular portakabins can be stacked, attached on any of their four sides and disassembled. The connections are made with bolted joints, so there is no need of welding for its assembly. The metal structure of our modules is basic to assess their quality and durability. Our quest is to develop a product of the greatest simplicity possible. For this purpose, we have two aspects that set our manufacturing guidelines. On the one hand, the rental market, which requires the module to be robust, since it is going to be subjected to continuous loading and unloading. 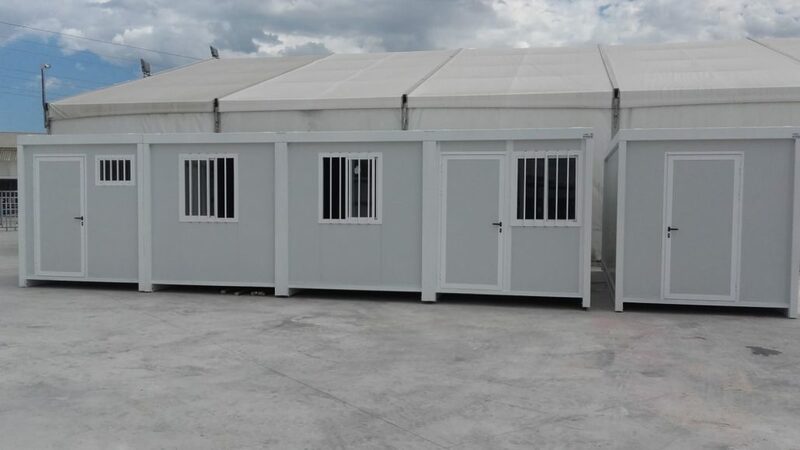 On the other hand, the export market, where we need a portakabin easy to assemble, even by people without any previous experience. A balance is needed between optimizing space in the container and ease of assembly, as transport has an impact on the final price. The basic structure consists of two U-shaped laminated profiles and OMEGA galvanized steel straps placed transversally achieving major stability supporting vibrations and heavy load. The roof structure is made of galvanized, folded or profiled profile. Due to its design, the roof structure serves also as the water collection gutter and the support to fix the roof and façade panels. The columns are made of structural steel tube profiles. They can be joined by simply screwing to the base and roof structures. 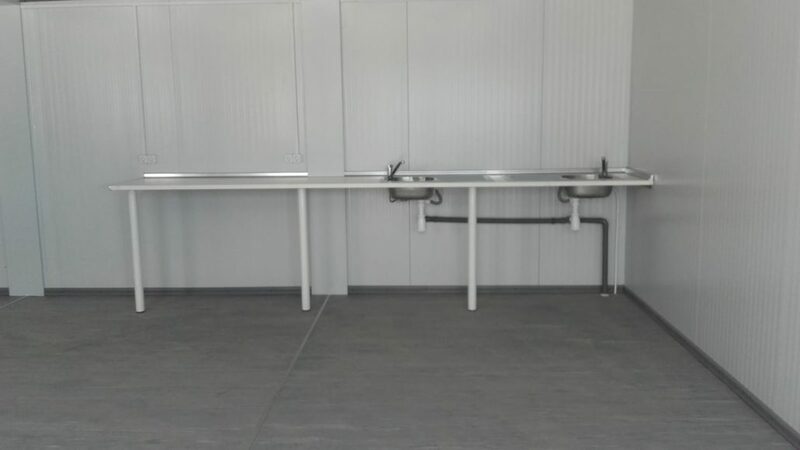 The fixings or joints between the base frame, the columns and the cover are bolted, and do not require any welding. In the case of standard modules, a water resistant plywood is placed over the metal straps, covered with grey vinyl PVC floor covering Sintasol Traviata. The PVC is glued to the plywood. This finishing of high quality allows brushing. In case of standard modules, the side walls are formed by sandwich panels. Each panel consists of 2 lacquered galvanized steel sheets with a thermal and acoustic insulation medium density rigid polyurethane foam in the middle. As the floor structure, the roof structure is formed by two longitudinal beams, and two transversally of same section, shaped in cold in galvanized sheep. The cover is made by sandwich polyurethane 30mm panels type cover with trapezoidal patterns. The internal divisions are made with sandwich panels of the same characteristics as the ones used in the side walls. 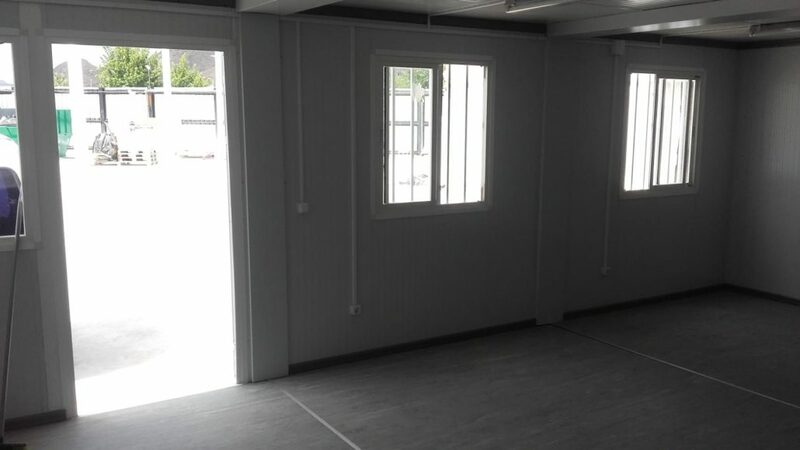 As for the carpentry, doors for standard modules are made of sandwich panel 40mm with a white aluminium frame. They have security locks. The interior doors are metallic, made up of two sheets of steel with a smooth finish and treated with epoxy paint. The windows are made of extruded aluminium profiles, with a white lacquered exterior treatment. Bay windows are also made of extruded aluminium profiles, with an exterior treatment lacquered in white. Standard windows are made with 4 mm float glass. Regarding plumbing installation, plumbing system is complete except for water input and sewage system up to the septic tank. The bathroom installations consist of multilayer polyethylene pipes with its accessories and hydraulic siphon. Those are connected with the special adhesives achieving a perfect water tightness. The standard bathroom accessories are made of white porcelain. For the standard installation we propose: porcelain toilet with low tank; porcelain washing basin with a support, a single tap for both hot and cold water and mirror; porcelain shower tray; and electric water boiler with steel tank. All the electrical system and installations are adapted to the safety requirements of low voltage. Electrical supply is connected to the electrical box with an independent protection via magneto-thermal switches and switches necessary for lighting, emergency devices (in case of having ones), air conditioning and other uses. The box is protected against the direct and indirect contacts, overcurrent or short circuit.